The fleece lining with soft merino wool inner and polyester outer has been a customer favorite for some time. Ortovox uses this combination of materials to create an even warmer product (350g/m2) with more wool that is just as resistant and breathable. The visual highlight: you can not only feel the main component wool in all areas – with the Fleece Plus Jacket, you can see the sheep wool fibers in their original state. 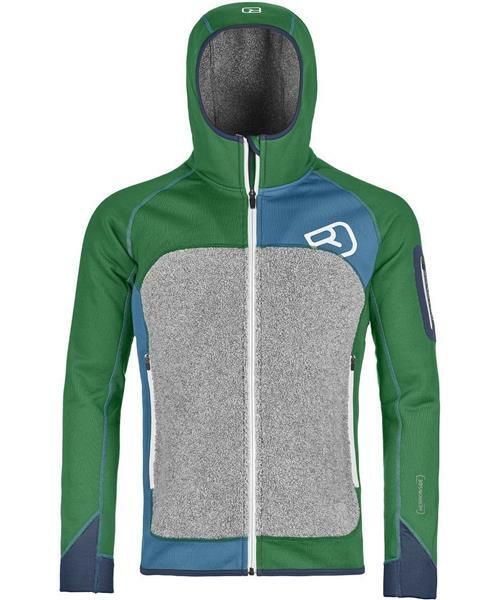 You’ll never want to take the Merino Fleece Plus Midlayer hoody off again! Thanks to the finest merino wool on the inside of the fleece hoody, it feels very pleasant on the skin. The ergonomic cut and use of elasticated materials ensures an optimum fit and great freedom of movement. Warming sheep’s wool on the inside of the collar and hood, as well as on the front exterior, provides additional protection against the cold and is also a real visual highlight. The two front pockets are perfect for storing away diverse touring accessories or simply for warming your hands. There is also a small, bonded pocket on the left upper arm. Ideal for ski touring on cold days.